Hummingbirds are among the smallest of birds, most species measuring in the 3-5 inches range. Anatomy, habitat, feeding, predators, reproduction and all the information about hummingbirds. There are between 325 and 340 species of hummingbirds and we present some of the best known. Several ancient cultures mention hummingbirds. Among them, Aztecs put them in a very special place. 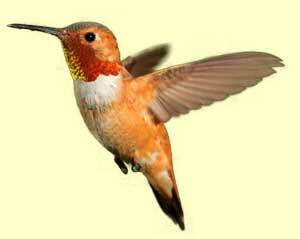 Information about Hummingbirds, Anatomy, Habitat Reproduction, Feeding and Predators. The Hummingbird is a very small species and one that may people are familiar with. There are 343 species of them that have been identified. They live in regions found all over the world in both North and South America. With such a large number of species it ranks them as the second largest bird family in the world. The size of these Hummingbirds does vary though based on the species. To give you a good idea of their overall dimensions the smallest species is about 2.2 grams and the largest is about 20 grams. The smallest is the Bee Hummingbird and it is also noted to be the smallest bird in the world. These charming birds get their names from the fact that the rapid movement of the wings make a humming sound. This is actually the smallest of all birds in the world. They are also the smallest type of animal in the world that has a backbone so they are often studied intensely by researchers. Another reason that the Hummingbird is so well loved and researched has to do with the fact that it has the ability to move in ways that other birds can’t. It is the only species of bird that is able to fly in all directions. This includes backwards and even upside down. It is quite the sight to see! More than 50 different species of Hummingbirds are known to mate annually in areas of Mexico. During the colder times of the year the Hummingbirds migrate up to 500 miles. They are able to cover a great deal of distance every day. The Gulf of Mexico is one of the common areas where they are seen during the migration period. This has become a very common place for bird watchers to gather and to take in the exciting sight. The mating rituals for the Hummingbird are interesting too. Known as the courtship dive, the males will go at least 60 feet in the air and then rapidly shoot down, make a U turn, and do it again. They will continue this process until they have the attention of a female that they can mate with. There are many types of food that Hummingbirds consume. They mainly will consume sugar and sap. They also consume pollen and they will eat small insects as a way to get protein. These birds can eat up to 3 times their own weight in food every single day. There are rumors about Hummingbirds hibernating but many people dismiss them. This is something though that has some truth to it. While these birds don’t have a typical season for hibernating they will do so if they need to conserve energy due to a lack of food. Then their metabolism slows down to an extremely small speed and they can continue to survive. Many people offer bird feeders in their yards where Hummingbirds come to feed. It is a great way to help these birds to thrive. At the same time many people find it is a great joy to have this type of bird in their yard so it is an exchange that works well for humans and nature to benefit from. The life span for the Hummingbird is often very short. The majority of them won’t make it past their first year of life. Those that do will typically only live up to 4 years. In many locations these Hummingbirds are having trouble surviving due to their habitat being taken away. Problems with trees being removed, a lack of food, and even chemicals and other elements in their environment has resulted in some serious drops in numbers for some of the species. Even with education and conservation efforts though it may be very hard to get those numbers back up.